Considering that the communication of the intestinal immunity with the systemic bloodstream can be a relevant adjuvant factor in the amplification of the host systemic inflammatory response and subsequent multiple organ dysfunction in sepsis, we aimed to evaluate the effect of the obstruction of the mesenteric lymph duct (OMLD) associated with massive fluid therapy in the early phase of sepsis and severe sepsis models. Adult Wistar-EPM rats were submitted to 108 (S8) or 109 (S9) CFU/ml Escherichia coli inoculum intravenously (i.v.) (DL80 within 26 hours), and were treated with hyperhydration (HH) with or without previous OMLD (n = 5/group). Control group were naïve animals (N) and animals submitted to HH or sepsis only. The mortality of groups was followed up to 30 days after experiments and microcirculation monitoring was observed at 6 hours post sepsis induction by videomicroscopy (sidestream darkfield imaging (SDF)). The effect of OMLD + HH reduced significantly the sepsis mortality rate: S8 (60% to 14.5%) and S9 (80% to 60%). 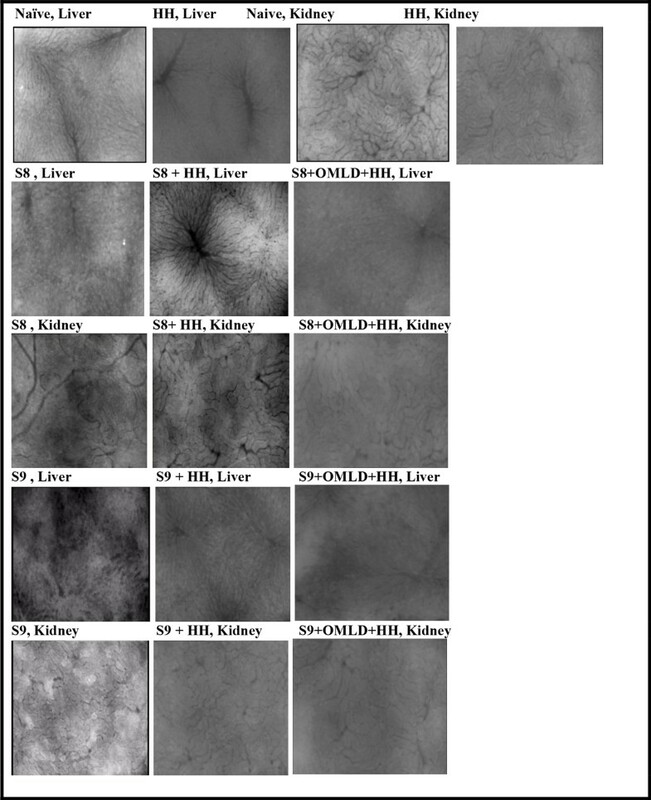 Besides, the liver and kidney microcirculatory features were better preserved as compared with untreated sepsis groups under video-microscopy (SDF) monitoring. (Figure 1). Splanchnic organ's microcirculation following 6 hours after sepsis or HH procedures by SDF monitoring: (a) HH; (b) S8 + OMLD + HH; (c) S9 + OMLD + HH. These preliminary findings showed that both HH and OMLD have a potential therapeutic application in sepsis by minimizing the splanchnic organ's microcirculation dysfunction. Grant number 2011/204014, São Paulo Research Foundation (FAPESP).